More than half of Californians fear they or their loved ones will lose health coverage if the Affordable Care Act is repealed and replaced, a new statewide poll shows. A poll by the Institute of Governmental Studies at the University of California-Berkeley, released Tuesday, unmasks a deep sense of insecurity across the Golden State, especially among low-income residents and people enrolled in Medi-Cal, the state’s version of the federal Medicaid program for low-income people. The poll found that 56 percent of Californians worry that they or someone in their family will lose health insurance if the federal health care law, also known as Obamacare, is terminated. The level of concern jumps dramatically among Californians whose household income is less than $20,000 per year and people enrolled in Medi-Cal. About 4 in 5 people in those categories fret over the potential loss of coverage. Medi-Cal covers 13.5 million Californians, about one-third of the state’s population, and nearly 4 million of those enrollees joined as a result of the program’s expansion under Obamacare. “We all have friends or relatives who are or have been on this program,” said Jennifer Kent, director of the state Department of Health Care Services, which administers Medi-Cal. A GOP bill passed by the House in early May would not only eliminate the major planks of Obamacare but also cap the flow of federal dollars going to Medicaid. The nonpartisan Congressional Budget Office estimated that the proposal would leave 23 million more people uninsured by 2026 than under Obamacare and reduce federal spending on Medicaid by $834 billion over 10 years. The House sent its measure to the U.S. Senate, whose leaders now are secretly drafting their own version of a health bill and aiming for a vote before July 4. With the ACA facing a major existential risk, its popularity in California has never been higher. The poll found that roughly two-thirds of state residents support the law. That represents a record level of public support, said poll director Mark DiCamillo. Pollsters, who conducted the survey on behalf of the California Health Care Foundation, interviewed 1,845 Californians through most of May. Medi-Cal was a major focus of the poll, and more than two-thirds of respondents said it is important to them and their families. Diana Mullis of Sacramento said it would be “scary” if her husband and 4-year-old daughter lost their Medi-Cal coverage. Her daughter is healthy, and she mostly sees doctors for routine shots and check-ups. But Mullis, 33, knows that Medi-Cal will protect her family from massive medical bills and bankruptcy should her daughter or husband ever land the hospital. “That’s not going to be the case if things roll back,” said Mullis, who has employer-sponsored insurance. Lanhee Chen, a fellow at Stanford University’s Hoover Institution, supports the repeal and replacement of the ACA. He believes fearful Californians are being influenced by media coverage. “Are they getting the full picture of what an effort to repeal and replace Obamacare would look like? I would suggest they’re not getting a full picture,” he said. He pointed to the majority of Californians who have employer-based coverage and said they wouldn’t be dramatically impacted by an Obamacare repeal. “The vast majority of Californians, if the ACA goes away, probably won’t see an effect one way or the other,” he said. And those on Medi-Cal may not lose their coverage, especially if California takes its own steps to keep residents insured, he added. “California could make the decision to raise taxes,” he said. But Kent, director of the state’s health care department, counts herself among the worried Californians. She said she has been losing sleep over the future of the ACA and Medi-Cal. “Any change at the federal level that happens in Medicaid has the potential to have both serious and/or catastrophic effects in the state,” she said. California Healthline reporter Pauline Bartolone contributed to this report. California Healthline is produced by Kaiser Health News, delivering expanded coverage of health policy news in California and original reporting that highlights the state’s outsized influence on the nation’s health care system. Despite days of intense negotiations and last-minute concessions to win over wavering GOP conservatives and moderates, House Republican leaders last Friday failed to secure enough support to pass their plan to repeal and replace the Affordable Care Act. [Update]: Apr. 4, 2017 to correct spelling of author Mary Agnes Carey’s name. SB10 is it worth it? What is an exemption? Nidia Torres says paying a penalty for not having health insurance is unfair if you can’t qualify for an affordable plan. It’s not easy to find health care coverage when you don’t even know where to start looking, she says. Torres, 34, has Deferred Action for Childhood Arrivals (DACA) status, making her eligible for a reprieve from deportation and a work permit, but not for health insurance through the Affordable Care Act (ACA) —also known as Obamacare—due to her quasi-legal status. Senate Bill 10 – the #Health4All Waiver – signed by Gov. Jerry Brown Friday, however, could open the door to coverage for her and other DACA recipients and people who are undocumented now excluded from ACA coverage because they are not considered lawfully present in the country. While many cheer the legislation as a positive step toward inclusion for immigrants, its impact may be more symbolic than practical since it does not give them access to the subsidies that are often what makes coverage affordable. SB 10, authored by Sen. Ricardo Lara (D-Bell Gardens), allows California to seek a federal waiver to allow undocumented immigrants and DACA recipients to use their own money to buy health insurance through Covered California, the state’s online marketplace. Under ACA, states can apply for a waiver to modify provisions of the law based on guidelines set by the U.S. Department of Health and Human Services. “This bill presents an historic opportunity for California to become the first state in the nation to request a federal waiver,” said Sen. Lara Friday in a statement. If approved, California’s waiver will have no financial impact on the federal government because SB10 does not allow DACA recipients or the undocumented to receive the government subsidies that lower the cost of monthly premiums. Nevertheless, proponents see it as an important step forward, and Covered California estimates as many as 50,000 more people — who make too much money to qualify for Medi-Cal — may buy coverage through the marketplace if the waiver is approved. Torres, a single mother of one, makes about $23,000 a year, which she told EGP is too high to qualify for Medi-Cal but not high enough to purchase insurance on her own. “I have been wanting to go to the doctor for a physical exam but I was told it is about $100” since I don’t have insurance, she told EGP, explaining she opted to pay for a one-time visit at a community clinic rather than struggle to pay monthly for insurance. “It’s not that I don’t want to buy the coverage, but I can’t afford it,” she told EGP. SB10 will not give her access to a plan she can afford. Lara’s spokesperson Jesse Melgar told EGP that even though subsidies are not provided under SB 10, it does fight for health care for all. 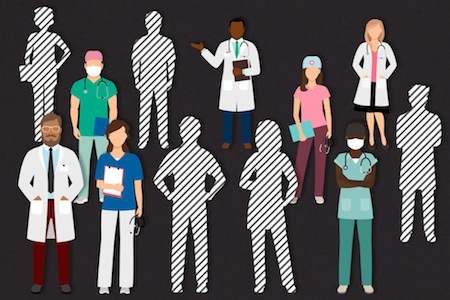 We recognize that SB10 would make a modest change but “we think the change is still important, beyond the symbolism of inclusion and of an explicitly exclusionary policy in the ACA,” Anthony Wright, executive director of Health Access California told EGP. With over 70% of undocumented Californians in mixed-status families, it means many will get subsidies, said Wright, citing examples of two situations where people will benefit from access to Covered California. The first involves a family of three, with the child receiving free Medi-Cal, one spouse getting subsidized coverage for about a $50 a month, and the other spouse paying about $250 a month for unsubsidized coverage. 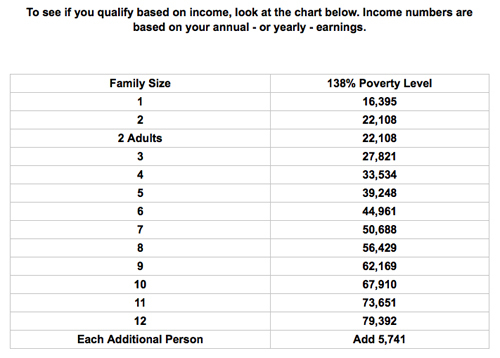 “As a family, on their income, $300 might be a stretch, but it might be doable depending on how they prioritize it,” he explained. Access to California’s health exchange would also benefit people who have the means to pay for coverage, like contract workers in the Silicon Valley who do not have employer sponsored health coverage, Wright said. In an interview with California Healthline, however, insurance agent Alex Hernandez said people are not rushing to buy health care plans because of the high-cost. Hernandez calculated that a woman in her mid-20s, making about $45,000 a year, would pay $304 per month for a standard Anthem-Blue Cross plan through the exchange. If she buys that same plan directly from Anthem, it would cost $303.30, he told California Healthline. Giving all Californians access to Covered California makes the health care system more inclusive and efficient, contends Maricela Rodriguez, a program manager with The California Endowment. “Not all undocumented individuals will be able to afford health care through Covered California and will remain ineligible for Medi-Cal,” she told EGP in an email, acknowledging that the measure is not a total solution. “Without the assistance of subsidies, affordability will continue to be a barrier for many. Which is why this is only a first step and why we, along with advocates and policy leaders, will continue to fight for health justice for everyone,” she said. The federal government has 225 days to grant or deny permission. In the meantime, DACA recipients and undocumented immigrants, like Torres, who were excluded from Obamacare but penalized for not having health insurance can seek a refund and exemption from future penalties. When Torres filed her 2015 taxes through H&R Block she was penalized about $200 for not having health insurance in 2014. “I didn’t know I was exempted,” she said. The Covered California website states that DACA recipients and undocumented immigrants are eligible for an exemption to the tax penalty for being uninsured. Not every tax preparer is aware of the exemption, however, and many will just have their clients pay the penalty. It’s important for DACA recipients to explain their status to their tax preparer before they file, says Elba Schildcrout, Community Wealth Dept. director and tax preparer at East LA Community Corporation (ELACC). ELACC partners with Volunteer Income Tax Assistance (VITA)—an Internal Revenue Service program to help low- and moderate-income taxpayers file returns at no cost. Once DACA recipients have disclosed their status, tax preparers must file Form 8965 Health Coverage Exemptions along with their 1040 tax return. DACA recipients who previously paid the penalty can file an amendment to get their money back, said Schildcrout. The process is doable, she said, but added that tax preparers usually charge to file the amendment. It’s sad to see clients pay for an amendment to a tax return that was done wrong, she told EGP. According to Schildcrout, the VITA program can help DACA recipients who were charged a penalty for not having health insurance to file the amendment at no cost. June 15, 2012 was a historic day for thousands of young immigrants who under President Obama’s executive action became eligible for temporary relief from deportation. “These are young people who study in our schools … they pledge allegiance to our flag. They are Americans in their heart, in their minds, in every single way but one: on paper,” said Obama when he introduced Deferred Action for Childhood Arrivals (DACA), a program making nearly 1.5 million youth brought to the country illegally as children eligible for a reprieve from deportation and a work permit, both renewable every two years. Over 853,000 immigrants between the ages of 16 and 31, often referred to as “dreamers,” have applied for DACA status since the president’s announcement. For many, with the ability to work legally came the hope of higher wages and perhaps benefits. Getting health insurance, however, has not been easy for some. For others, it’s not a priority. The Affordable Care Act (ACA) enacted in 2014—commonly known as Obamacare— excluded DACA recipients from coverage because they are not permanent legal U.S. residents or citizens. In this three-part series, EGP looks at some of the challenges this group of dreamers face in their search for affordable health care and the options they have to access services. DACA and Obamacare: Who Qualifies? 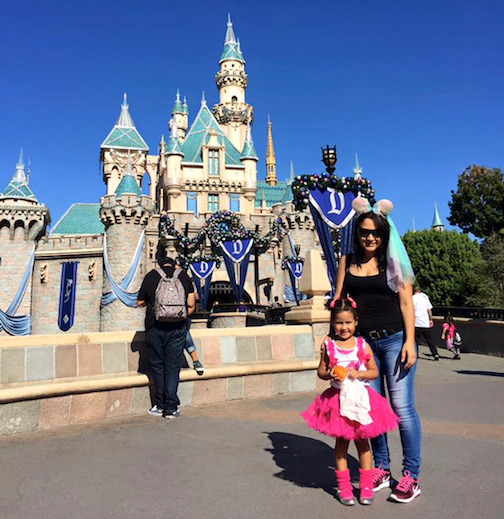 Los Angeles resident Nidia Torres was brought illegally to the U.S. when she was six years old. She lived in the shadows for over two decades, hoping not to be discovered or deported back to Mexico, a country she does not call home. In 2013, everything changed. Torres was granted DACA status and excitedly started planning for the future. The opportunities a work permit, driver’s license and social security number would bring to her life were endless, including providing a better future for her U.S. born daughter, Torres told EGP. “No more shame for being undocumented,” she recalls thinking when her work permit arrived in the mail. Torres soon landed a job waitressing at a national restaurant chain where she was paid minimum wage plus tips, but did not offer health insurance. “I can work legally, my daughter has Medi-Cal, so I think I’m OK,” she told EGP, explaining that after years of low-paying jobs and long hours that left her little time for her daughter, the new job was a big step forward. “I just wanted a job,” she told EGP. “Plus I don’t really get sick,” so health insurance was not a big deal, she said, adding she had no idea where to get coverage on her own. Torres, who speaks both English and Spanish and has some college education has since been promoted to manager and is earning more money, but still has no health benefits. The goal of the Affordable Care Act was to increase “the quality, availability, and affordability” of private and public health insurance to the then over 44 million uninsured Americans, providing they are legal permanent residents or U.S. citizens. To keep costs down, large numbers of young, healthy individuals — the same group targeted by DACA — would have to be enrolled, yet undocumented immigrants and DACA recipients are ineligible to buy health coverage through government sponsored health exchanges or receive premium tax credits or other savings on marketplace plans, even though they pay into the tax system. Gabrielle Lessard, a health policy attorney with the National Immigration Law Center, calls the policy unjust. DACA recipients are working and paying taxes for a service that they can’t apply for, she told EGP. “The exclusion of DACA recipients probably increases the price of insurance for all other people,” Lessard said. In California, however, some low-income undocumented immigrants and DACA recipients may qualify for Medi-Cal, a state funded health insurance program for low-income families, people with disabilities, pregnant women, children in foster care and low-income adults who meet certain requirements. Torres is not one of them. According to the California Department of Health Care Services and federal eligibility requirements, Torres’ $23,000 a year income puts her just slightly above the $22,108 maximum Federal Poverty Level (FLP) for a family of two, making her ineligible for Medi-Cal. Many DACA recipients don’t even know they have options, the study found. The lack of information reflects “the complexity” of the network of programs available and the process to access them, researchers stated. Getting health care doesn’t have to be a problem, says Irene Holguin, director of community relations with Arroyo Vista Family Center, a network of five clinics serving the east and northeast side of Los Angeles. During a free family health fair Friday at Arroyo Vista’s clinic in Lincoln Heights, Holguin told EGP there are options for everyone, regardless of immigration status or income. When people arrive at one of our clinics for the first time they undergo a financial screening to determine what types of programs they are eligible for, she said. “We don’t turn anyone away,” she added. She explained that the clinic offers discount programs and fees to those who not qualify for state or federal funded program. For example, if a patient can only pay $10, Arroyo Vista will help them set up an affordable payment plan for the balance, Holguin said. The Arroyo Vista clinics provide primary health care in communities where approximately 98% of families are Latino and many of them low-income, explained Holguin. As for Torres, she told EGP she would be open to going to a clinic like Arroyo Vista to look into her what her options are. “Better safe than sorry,” she said. 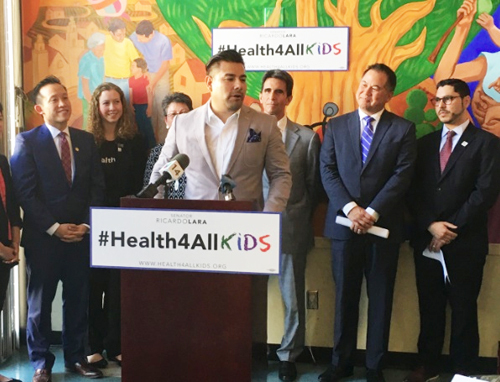 New America Media – Kicking off his statewide tour to promote California’s Health for All Kids program, the new law’s author, State Sen. Ricardo Lara, D-Bell Gardens, said undocumented parents should set their fears aside and enroll their children in the program. The legislation would expand the state’s health insurance program for low-income people. “There’s a misconception among immigrants,” Lara said, that asking for government help could land them in trouble. He made this observation during a May 12 media presentation at San Francisco’s Mission Neighborhood Health Center. Mindful of this, the Health for All Kids program – which launched on Tuesday — was designed so children who currently have limited access to health care through the Emergency Medi-Cal, Healthy San Francisco or Healthy Kids programs would “seamlessly transition” into full-scope Medi-Cal (California’s version of Medicaid), said Lara. He was flanked on the podium by State Sen. Mark Leno, D-San Francisco, and Democrat Assemblymembers Phil Tang and David Chiu. Representatives of such health advocacy groups as Children Now, Health Access, California Pan-Ethnic Health Network, Asians Advancing Justice and California Immigrant Policy Center also spoke at the media briefing. An estimated 170,000 undocumented children are eligible to enroll in the state-funded program, expected to cost $40 million in the first year of its operation, and $137 million annually “in perpetuity,” Lara said. Lara drew on his experience growing up in the United States as the child of poor undocumented immigrants from Mexico to emphasize why it’s important to have children enrolled in health insurance. “Children shouldn’t have to worry about how their parents are going to pay for a broken arm or for a dentist,” the lawmaker said. Leno, who chairs the Senate Budget Committee, said the importance of the Health For All Kids program can not be overemphasized because illnesses make no distinction between documented and undocumented people. “Our bodies, viruses, bacteria don’t know what our immigration status is,” Leno said. He noted that dental problems alone results in around 500,000 children in California missing school each year. Leno’s elicited laughter when he quipped, “Get a clue, Donald Trump.” He was referring to the Republican presidential presumptive GOP nominee’s vow to upend the Affordable Care Act (ACA) should he become president. 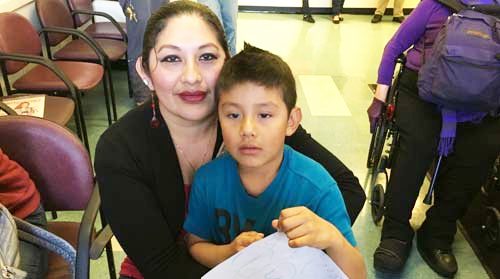 Undocumented Bay Area resident Teresa Lopez, a mother of four children, said she would be relieved to see her Mexico-born daughter, Litzy, age 15, enroll in the full-scope Medi-Cal program and enjoy accessing health care the way her two U.S.-born children currently do. Lara noted earlier this week that the California Department of Health Care Services, which operates Medi-Cal, has said it is ready for the influx of thousands of children when the Health For All Kids program begins next week. Lara is hopeful that Gov. Jerry Brown will sign his second bill, SB 10, which is currently making its way through the Legislature. It would allow the state’s undocumented adults to buy unsubsidized health insurance on Covered California, the online marketplace set up under ACA, with their own money. More than 2 million people currently have no access to health care, Lara said. California has sought a federal waiver to allow its undocumented population to purchase health insurance on the marketplace. “We hope we get the waiver before the administration in Washington changes,” Lara said, suggesting that the next U.S. president might either dismantle ACA or make drastic changes to it. 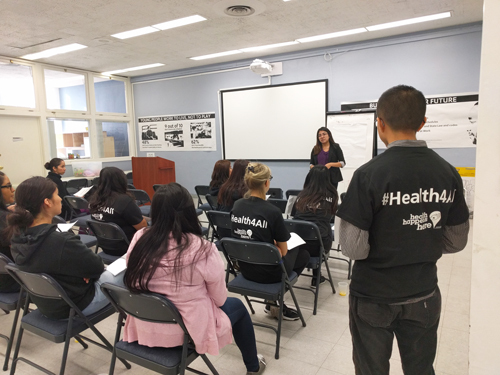 In the wake of the new Health For All Kids program, Lara was asked how the state could cope with the large influx of new Medi-Cal enrollees when there is already a shortage of doctors and dentists in the Medi-Cal network. He said that said he hopes lawmakers would make the program more attractive to health care providers by increasing reimbursement rates, currently among the lowest in the nation. “We are going to keep pushing for this,” Lara said.